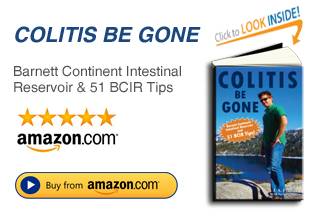 So I wrote a BCIR book (Colitis Be Gone) about my experiences with the Barnett Continent Intestinal Reservoir (BCIR) and my decision to get the surgery. 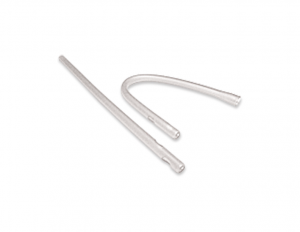 I also talk about my years with colitis and how it led me to go with the BCIR Surgery. I wanted to give anyone with colitis an outlet for support, and to talk about an option called the Barnett Continent Intestinal Reservoir that might give you your life back! I hope to reach out to those who may feel alone in their suffering and let them know that there are others with colitis who are also looking for solutions. My first goal is to reach out to people with colitis, and not only make them laugh, but help them feel they are not alone with this disease. A second goal of the book is to lay on the table an option for the severe colitis sufferers. An option they may not be totally familiar with called BCIR or Barnett Continent Intestinal Reservoir. A third goal here is to offer some tips for the BCIR recipients out there based on my experiences with it over the past 14 years. Not that I’m the only one with some insight into the BCIR, but I have learned many tricks and there isn’t much out there that’s published. I tried to make it a fun read and I tell many poop jokes. 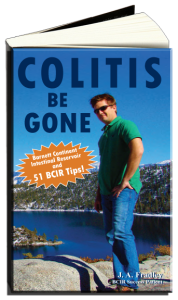 Ultimately it was years living with colitis before I heard about BCIR and maybe my book will help get the word to others suffering with colitis as a viable solution.